We're coming into the busy holiday buying season, and in order to cut down the number of "what should I buy" emails I get (or at least focus them better ;~), I thought I'd summarize some of my thoughts in a few articles. On each of my sites you'll soon find a guide to the products that I think you should be considering if you're in the purchasing mood this year. This site covers mirrorless cameras, and this is the second of that series of articles, targeting mirrorless systems (the first, on DSLRs, is here). Compact camera sensor size: Pentax Q-7. You'd buy into this system solely to stay really small, I think. 1" sensors: Nikon 1 (S1, J3, AW1, V2). These cameras are known for their DSLR-like focus systems: fast and able to follow action well. m4/3 sensors: Olympus (Pen and OM-D) and Panasonic (numerous Gxx models). The first to make it to full system status, and still the leader with the widest range of cameras and lenses to choose from (especially when you consider new and used). Sensor size is dead square between compact camera and full frame, and many think that's a sweet spot. 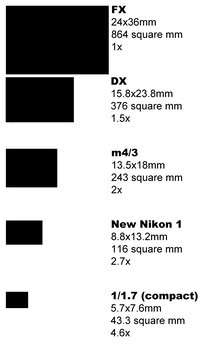 APS sensors (Nikon DX): Canon (EOS M), Fujifilm (X series), Samsung (NX), and Sony (NEX) (also Pentax K-01 if you can find it). These are crop DSLR sensors in smaller mirrorless bodies. All but the Canon have a good set of lenses to choose from, but be careful, APS-sized lenses have a tendency to be bigger (e.g. as big as crop sensor DSLR lenses) so you can start to lose the size advantage that many mirrorless systems have over DSLRs. On the other hand, the sensor should perform just like the crop sensor DSLRs. There are some APS-sized mirrorless systems with smaller lenses available (Samsung, in particular, has a lot of compact lenses), but the longer the focal length, the more likely the rule of “bigger” applies. 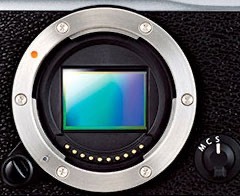 Full frame sensors (Nikon FX): Sony's recent A7/A7r entries, with limited lens support at the moment. Oh, and Leica if you can afford it. Generally, you purchase a mirrorless system for "balance." You're usually balancing image quality against system size and weight. For common uses, though, there may be less image quality differences than you might expect. Shooting in good light, all of the systems do quite well these days. It's in very low light, high contrast situations, and overall pixel count where you start to see some advantages to the bigger sensors over the smaller ones. For most people, I'd stay in the 1" to APS range, and particularly in the m4/3 to APS options. If you can't find what you want in the systems using those sizes, I'm not sure what you want exists in mirrorless. I've been using m4/3 cameras for over four years now and am very happy with what we have available now. I've been using Nikon 1's for a few things since they appeared, and I'm mostly happy with what I can do with them. I have the least in-the-field experience with the APS systems, though I've used at least one of them on every one of my many trips over the past three years, and they've performed well for me. However until recently I haven't had the full set of lens options with the APS cameras I've wanted. Fortunately, that changed in the last six to twelve months, so I suspect I'll be shooting more with the APS cameras in the future. Before we get to cameras, we should discuss lenses. You buy into a "system" because of the "system," so make sure the system is there for you, or at least likely to be there for you sometime soon. On each of the header pages in this site's lens database (e.g. click on the manufacturer's name, not the sub-menus for the actual lenses), you'll find known road maps for future lenses. So if the lenses you want aren't already out, check that to see if they're coming soon. Best system for lens choice: m4/3, without a doubt. With both Olympus and Panasonic building lenses for m4/3 plus at least seven active third-parties developing for the mount, there's a lot of glass already available and much more coming. Moreover, aside from some of the low-priced kit-type lenses, most of what's available is exceptionally good. Now that E-M1 owners can get decent focus performance from the old 4/3 lenses, there really isn't anything other tilt/shift lenses that you can't find (and you can mimic that via an adapter using a larger systems lenses if you really need it). Top performers you'll want to consider include: 12mm f/2, 20mm f/1.7, 45mm f/1.8, 75mm f/1.8, 7-14mm f/4, 12-35mm, 12-40mm f/2.8, and 35-100mm f/2.8. I tend to carry some subset of those in my bag at any time. It's an impressive set of lenses that perform great (with some slight need to understand how to do software correction of linear distortion if you shoot raw). If m4/3 is weak, it tends to be weak at telephoto, though E-M1 owners should look at the SHQ 4/3 lens set to cover that. Honorable mention for lenses: Fujifilm X (three of them in photo, above), Samsung NX, and Sony E (but not FE). I'm particularly impressed with the Fujifilm lens set: there's not a bad egg in the bunch. But…the telephoto zoom is big and awkward for a small system, and the high quality metal builds make the lenses a bit heavier than you might expect. Samsung has produced great optics and a set of pancakes that make for very small kits, but once you get above 55mm the lenses start getting big and awkward (a common problem for APS sensor mirrorless). Sony started slow and initially delivered some weak lenses (the 16mm f/2.8, for example), but things have improved considerably in the last year, especially with Zeiss coming on board as a third party choice. The kit lenses are weak for NEX, but the primes tend to be good and the most recent zooms (e.g. the 16-50mm f/4) are starting to show what the NEX-7 can really do. Special mention for lenses: Nikon 1. Other than the original kit lens and the 10mm f/2.8, the rest of the lens set has been excellent. But the special mention is mostly because of focus speed and the fact that you can put Nikon DSLR lenses on a Nikon 1 camera and get some incredible results, still with fast autofocus capable of following motion. Nikon wildlife shooters should have a V2 and FT1 adapter in their bag, as I showed in my recent Botswana Photo Workshop Blog and accompanying article here. Work in progress: Sony A7/A7r. Not enough lens choice at the moment. The large sensor also makes it likely that we'll see some awkward lenses on this system, too, especially as we move into telephoto ranges. Sure, you can put an adapter on the camera and use many existing full frame lenses, but I'm not a big fan of this approach as you lose features, and on a 36mp camera, I'd worry about mount tolerances and edge to edge issues with wide angles. Nikon 1 — Only two cameras worth looking at: the AW1 (waterproof, submergible), and the V2 (plus the V1 if you can still find one). I use both situationally and am happy with what they do. m4/3 – Best option? The Olympus OM-D E-M1. If you don't mind giving up some of the focus performance, the E-M5 is a fine "bargain" version of the same thing that’s smaller and with slightly different controls. I'm still testing the Panasonic GX7, but I think it very safe to say I’ll be adding it to the recommended list. I haven't gotten my GM1 yet, so can't really say anything about it. I really don't recommend the GH3 unless you're heavily into video. It's too big and too expensive compared to the OM-Ds for still work, I think. I'm also not very into the Pen line any more. At the right price, sure. But the E-M5 and GX7 are small enough and more capable. Fujifilm – This may surprise you: X-E2 or X-A1. I very much recommend either. The X-E2 if you're looking for EVF and the best focus performance, the X-A1 if you're looking for the very best price/performance I've seen in mirrorless to date. The X-A1 kit is, I contend, the best mirrorless value out there right now (US$600 includes 16-50mm lens). Superb image quality out of the non X-Trans sensor and a really decent lens, to boot. The combo is a bit big, though, and it doesn't have a viewfinder (e.g. uses the rear LCD to compose, and that LCD is a little difficult to see in really bright light). The X-A1 is one of the reasons why I've gotten so lukewarm on the Pens. The X-E2 meanwhile, finally gives Fujifilm some snappy focus performance, and everything else about the camera is first rate, too. Samsung — At the moment, it's NX300 or nothing, I think. The NX300 is a very good camera. Certainly equivalent to any of the other arms-length cameras (e.g. no viewfinder). Samsung's sensors are getting very close to Sony's in capability, and camera design itself is no-nonsense and quick to learn, and doesn’t get in the way. Sony – I'm a little torn. It used to be that the NEX bodies were over performers and the lenses weren't there. Now I'm starting to feel things are reversing. There's nothing particularly wrong with any of the NEX bodies: they all perform well. But Sony seems to be moving away from the NEX UI (and name, for that matter), and for good reason: it was the most contentious of the cameras' traits. The NEX-7, meanwhile, went a slightly different direction, then the NEX-6 pulled back in yet a different direction. So I'm left wondering "what is NEX?" At this point in time I'd still recommend the NEX-7, though it's due for an update soon. Other than that, only the NEX-6 really seems to hold its own against where all the other comers have gotten, I think. In other words, I'm lukewarm on the NEX-3 and NEX-5 these days. As for the A7/A7r, I haven't gotten my bodies yet so can't speak to them yet. I expect them to be very good, but lenses will be a challenge for awhile until the system gets fully going. So the full list of mirrorless bodies I can recommend without reservation: Fujifilm X-A1 and X-E2, Nikon AW1 and V2, Olympus OM-D E-M1 and E-M5, Panasonic GX7, Samsung NX300, and Sony NEX-6 or NEX-7. For every other option I'd say that you'd need to be getting the camera at one heck of a good price and know what you're trading off. Heck, even for the Nikon 1 and Samsung NX300 I'd say the same thing, though these are cameras I continue to be impressed with for specific uses. If you really shoved me into a corner and asked me to pick just a single lower-end option and one higher-end option, it would be the Fujifilm X-A1 at the lower end and the Olympus OM-D E-M1 at the high end (though I suspect the price sensitive would be happy with the X-E2, OM-D E-M5, or GX7, I think). Funny thing is: what’s in my bag for this afternoon’s shooting (casual; one of my go out and experiment and play days)? You guessed it, the X-A1 and the OM-D E-M1. I really do put my money where my pen is.